Starr Khan is a son of Shere Khan, a key herdsire in the world-famous Accoyo herd of the late Don Julio Barreda. 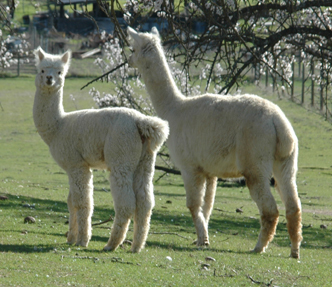 One of Derwydd's orignial Foundation dams, Finess has produced Ancha who sold at AOBA auction for $31,000, Tika who sold at AOBA auction for $38,000 and 4 OTHER outstanding females, and ALL her cria todate are females. Finess is rated as one of Derwydd's collectable dam lines. We plan to breed her this fall back to Derwydd Inti-Sapa for another shot at creating Tika again. 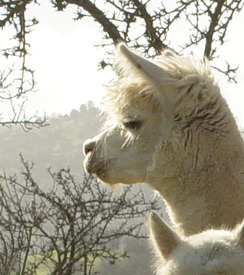 What if you could get a female cria EVERY TIME? Would that be worth IT?? Would THIS be the female YOU want to buy?? Well read on! Qolque is one of our prized foundation dams. Out of Accoyo Starr Kahn, who has very few offspring registered. She has given us 6 outstanding FEMALE crias. All her girls have had excellent bone, and incredible fiber, with bundling, brightness and very organized crimp throughout their blankets. Her first cria Quapah was bought at the 2004 AOBA auction by Magical Farms. Her 2nd cria Fista, retained in our breeding program (and Fista's first cria was a reserve champion white - Niqin); her 3rd cria Khuyay is sold. 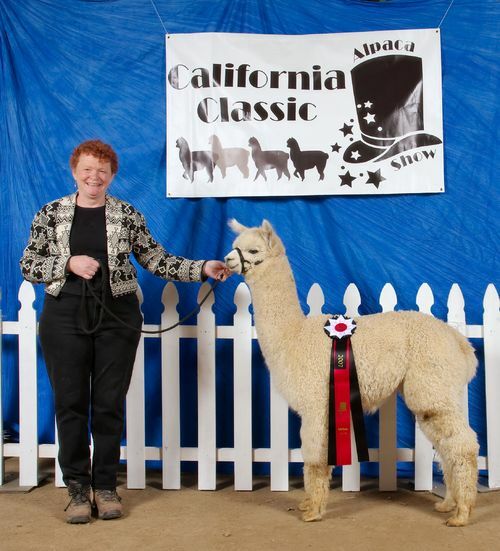 Her 4th cria (Alma) out of Presidio is fantastic and sold! Her 5th FEMALE FAWN cria out of SA Peruvian Grand Moreno weaned at 4.5 months at 70lbs. - boy can this gal milk! Her 6th cria is fawn and out of Inti-Sapa. AND you will note, nothing but female crias.. Her dam 4Peruvian Finess has produced EIGHT female crias (one died as a cria) in a row for us.. We are retaining Finess in our herd. It is extremely possible with 6 female crias on the ground that Qolque will continue to produce female crias as her dam has. We rate Qolque as one of Derwydd's collectible dam lines. 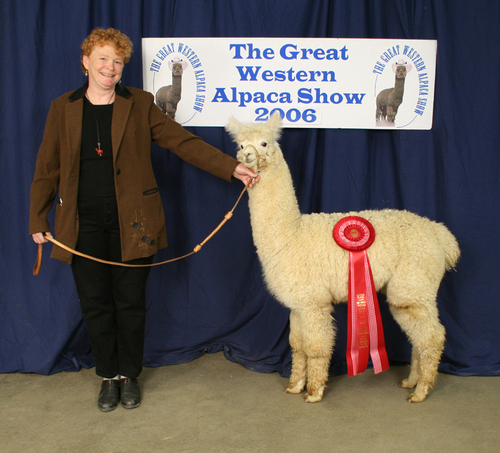 Qolque will be bred to Derwydd Accoyo Manchu, 5 time Champion/Reserve. This upcoming cria will be a knockout. HA, here is a the guarantee you've been looking for! If this next cria is a boy, we will agist them both for free until he is weaned and then purchase him for $5K and give you an additional free breeding. (We are pretty sure we will be keeping that 5K)! Qolque sells with an additional breeding to any Derwydd Herdsire Oct 1 - Mar 31, free transportation in the Continental US.